When I started this I had no idea I had read another book by this author, and if I had I wouldn't have read this one. 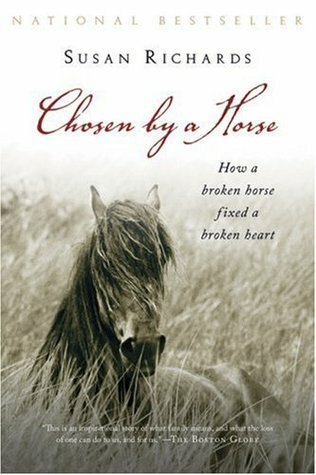 It wasn't that Saddled: How a Spirited Horse Reined Me in and Set Me Free was such a bad book, it just wasn't very good. About halfway through this one I started wondering and realized that I had read another book by this author and it was so unmemorable I had forgotten all about it. The good news is, I liked this one a lot better. In fact, I think the main problem with Saddled was that it tried too hard to capitalize on the author's success with this book. My biggest complaint with Saddled was that it advertised itself as a book about a horse but the horse part was minimal at best. Here, the horse takes a much bigger part and the entire book is more balanced. If I had read the books in publication order I might have actually liked Saddled because I would have been more invested in the author's struggle. Speaking about this book alone, it's good. The author does a masterful job of twining her life story with the tale about this rescue horse. I could relate to her feelings about toxic family members (although no one in my lfe was as toxic as her family, oh my gosh!) and her retreat into the company of animals for healing. I found myself rooting for her to succeed even while I wanted to smack her for wasting time with a man who didn't like anything she liked, including books and horses. I wish she had been able to tell us whatever happened to the foal, but that's probably asking too much. There is one more book in this series. That one is about her life after becoming a best-selling author, and I'm not sure it's going to make it on my to-be-read pile. If it shows up on sale on Audible, though, you never know. Four stars with half a star thrown in for the rescue.